I drink a cup of hot tea every morning (and then sometimes another again later in the afternoon). I can't think of anything that goes better with tea than scones. 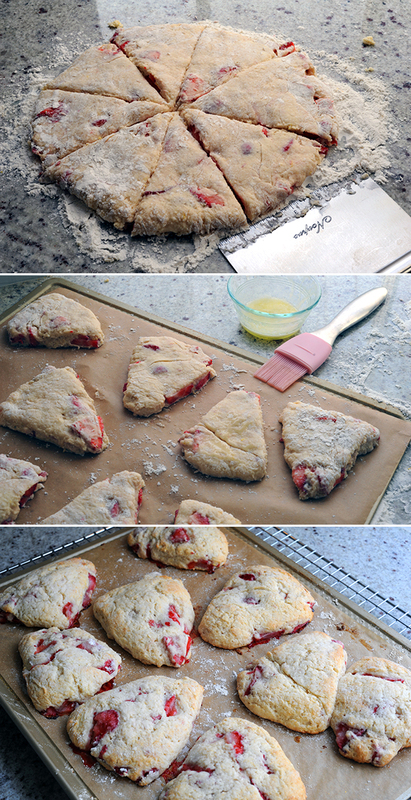 These fresh strawberry scones are light and airy. They are sweet and moist and smell like Heaven coming out of the oven. The secret ingredients? Greek yogurt and lemon zest. The fresh berries in these scones is what makes them so delightful. The fresh berries also make these scones only really good when eaten a couple of hours within baking—Beyond that, they get soggy. You can freeze them and then bake them individually which means you can have a fresh scone every morning! To freeze, transfer unbaked shaped scones to baking sheet and place in freezer to let chill until they are firm, 30-60 minutes. Wrap the scones individually and store in a freezer-safe bag until ready to bake. Bake as originally indicated, adding a few minutes to the baking time—until golden and crust is crisp. Combining the dry ingredients with cold butter in a food processor makes a light crumbly scone. Be sure not to over-work the dough. You want everything just combined. Next time I make these I am going to cut them into smaller triangles (simply slice the wedges in half). They came out beautifully but rather large (about the size of my hand). I think next time I would just like a smaller scone. Make sure you bake them until the outside is a light golden brown. This creates a crispy crust with a light and flakey inside. Preheat oven to 425 degrees. In a small bowl, whisk together the egg, yogurt, milk, almond extract, vanilla extract and citrus zest until blended; set aside. In the bowl of a food processor combine the flour, sugar, baking powder, and salt. Pulse briefly to blend. Add the butter pieces to the bowl with the dry ingredients and pulse several times to cut the butter into the flour, until the largest butter pieces are the size of small peas. Transfer the mixture to a large mixing bowl. Add the strawberries to the flour mixture and toss to coat. Add the wet ingredients to the bowl with the dry ingredients and gently fold together with a fork or spatula until a sticky dough has formed. Knead just a few times to ensure that all the dry ingredients are incorporated and the dough is cohesive. Transfer the dough to a well floured work surface and pat into a disc about 7-8 inches in diameter (dough will be sticky—more flour into dough with your hands until manageable). Slice the disc into 8 wedges (and then each wedge in half to make smaller scones). Line a baking sheet with a silicone baking mat or parchment paper. Place the shaped scones on the prepared baking sheet and brush with melted butter and then dust with sugar. Bake until lightly browned on top, about 15 to 20 minutes. Let cool a few minutes before serving.